We wrote a song! We, that are Rachel (NZL), Jette (New York) and I. This song tells of a magical place, my adopted home for the last 10 days, the Youth Hostel Plakias. It’s really fascinating what has developed here. I’ve never felt such a community during my last travels. People from 8 to 60+ years are not only sharing the bungalows, but all their time togehter, experiences, thoughts and emotions. It has something of an uptopia, a dreamworld, in which many guests already regularly escapes their ordinary lifes for 15 years. I've been very active, I barely said 'no' to any occasion and I was on the road almost every day and clearly celebrating every night. So here I am, still some Raki in my head, on the hostel’s terrace, and try not to be distracted from my friends here. As long as my clothes running in the washing machine, I have time to write, that's the deal. 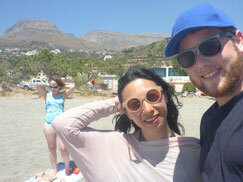 I had the great luck to meet my new friends Marc (F), Rachel (NZL_) and Simone(I) already in the bus to Plakias. We spend a lot of time talking about philosophy, debated, did tours, musc and celebratied together. Then the writer Daniela (I) and Jette (USA) joined the core team and it was perfect. But also every other guy here in the hostel is worth a mention. So many different people are here. Energy healers, jugglers, lawyers, students, long-term travelers, teachers ... it was a very homogeneous group. I would love to write an article for everyone And I know that the farewell tomorrow will be very difficult for me and I'm going to miss this dream world. At least the core team has decided to leave together and then separate step by step. This makes it easier, perhaps. 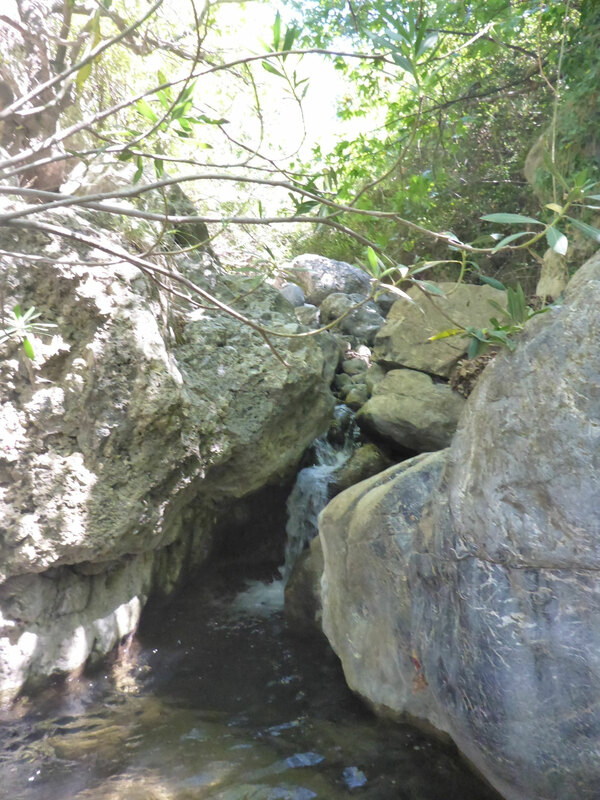 There’s a small river/stream just next to the hostel, which comes from the mountain and has formed a magical canyon. A must-do, according to Uli, the German Hostel manager. So we decided to go on this adventure at the very first day. We passed an olive grove and the relatively flat river up the gorge. We passed the ruins of an old mill and the stone houses of the former miller. A magnificent setting. The vegetation around the river bank got tighter. Which was very good, because at 36°C the shade was a delight. Crystal clear cool water on his legs made the hike even really pleasant. 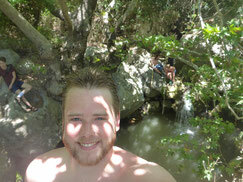 Beautiful rock formations formed small waterfalls and natural pools, where we took a short break and a bath. On some spots we also had to climb properly. Of course, it worked without any problems, but after a few meters in the river, my swimshorts were torn. Now at last, the ice was broken between all. And it had to happen to me, obviously. At the last pool, we even found a swing from a waterfall into the pool. Dangerous, but infinitely fun. On the way back we collected wild herbs for the hostel‘s kitchen. Lots of oregano, rosemary and sage. In a tavern, with a terrace and a panoramic view that is just beyond, we met up with another group, and ate very delicious. We shared all the dishes and I tryied out some snails. And I could prove myself again, that I eat EVERYTHING, but olives. The snails were really delicious. The river walk was so nice, that I did it again. Three days later, with a different group. 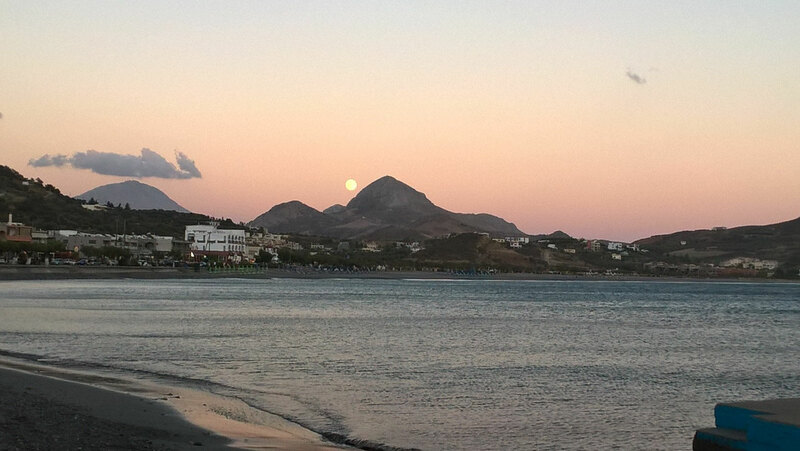 There are several beaches in the sourrounding of Plakias. Some of them well equipped and touristy, some of them isolated and lonely. The "secret" Hostel beach is about 45 minutes walk from the hostel and is called "One Rock Beach", as there is a large rock in the center of this narrow bay. You have to climb down a few meters to get onto the lonely, half nudist, beach. Challenging, but a blessing, since you can have a good rest here. 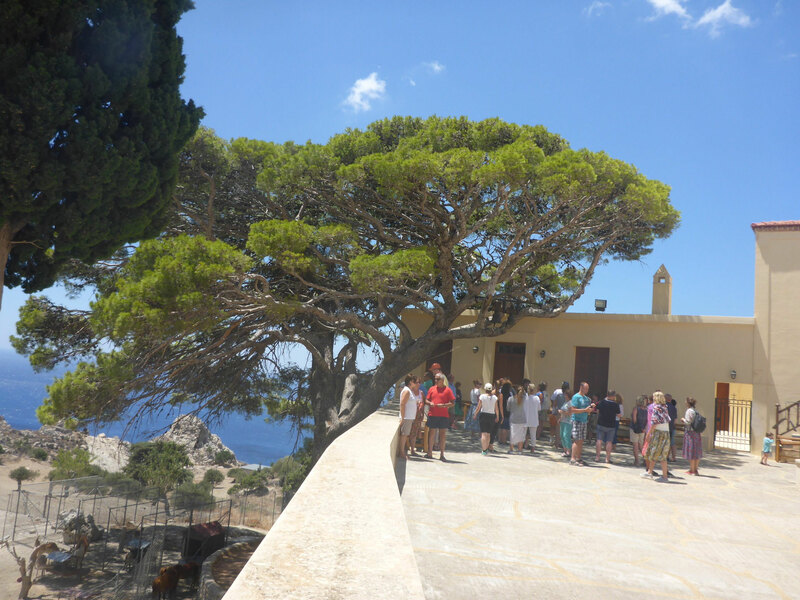 The south of Crete is not excluded from mass tourism, but it’s less busy, which is really good. Also the price level down here is much lower. But not only the relaxing quietness makes the One Rock Beach something special. We also had the opportunity to prove ourselves in cliff jumping. 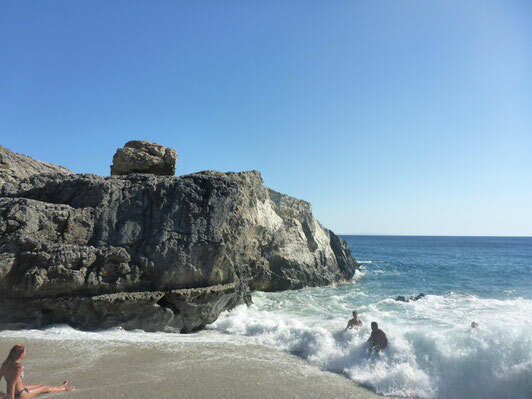 I you climb on some spikey rocks, you can reach a perfect spot to jump in the water in about 7m above the sea. I felt like spending two hours struggling on the edge.. I was the first and only, who dared to climb on that cliff... I was really excited and nervous ... but I did it! And it was amazing! Three times we came back to the One Rock Beach and every time a jump from the rock was mandatory. Everytime but once, as there where to many waves one day. On many days it was almost impossible to swim in the sea. Brutal waves and strong wind could make the beach to a painful event. But if the sea has been to rough, I enjoyed some hotel pools in the neighborhood. Now it was time to closer to culture and history, again. We visited an old monastery, which is located near the beautiful bay of Prevelli, since hundreds of years. It’s still managed by Orthodox monks and for a small entrance, visitors are allowed to enter. After the ladies had covered themselves with long skirts, we spent hours in the interesting monastery and learned about its importance during the World Wars and during the colonial period. The integrated museum showed impressive documents, paintings and sacred objects. Close to the monastery we visited a war memorial and a monument of friendship between Greece and the former British Commonwealth. Continuing our hike, went to one of the most beautiful places of the south coast. The palm beach of Prevelli. Approximately 1.5 hours, we had to hike in brutal heat and unpredictable wind. Of course, the beach was packed with tourists. So we decided to leave the beach and to move into the palm forest. A fabulous scenery of palm trees and rock formations. This gorge provides an incredible amount of variety. 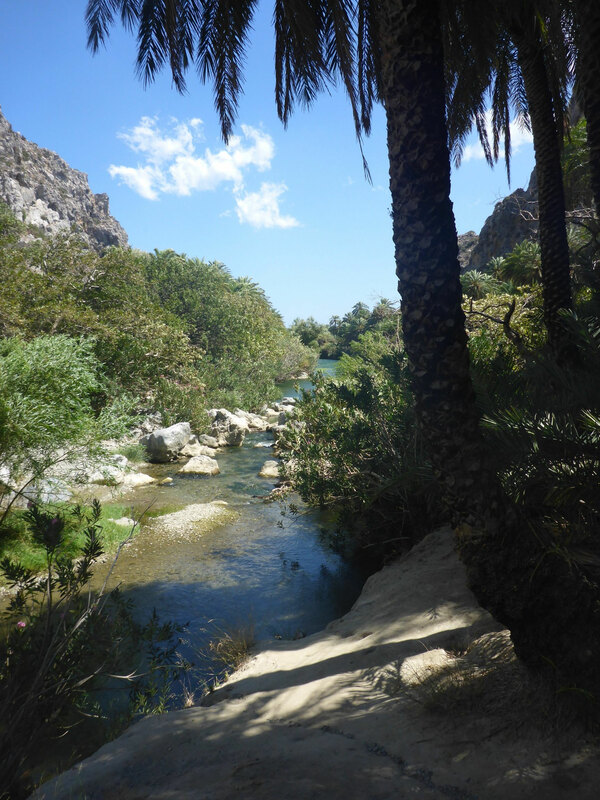 Some of us were walking up the river a bit, to reach basins full of clear freshwater and impressive fauna. We’ve been told, that we might see turtles up the river, but we only saw an eagle and a couple of fish. We took a boat to go back to Plakias, where weh ad a cracking meal, once again. We were sitting in the tavern until early in the morning to celebrate our community. the three lies of Plakias. So I was just another victim to that. If the two other lies applies to me as well? I won’t tell you. They are: "I will not drink alcohol today" and "I love you". One of the things, that I missed here, was the contact to local people. It's nice to meet many travelers, but for me, the contact with locals a key feature of traveling. My friend Ioannis (GR) is the only Greek here in the hostel. He taught us a lot about the Greeks and their behaviors. But now it’s time leave the illusion of the hostel behind. - A Cretan tradition: Fathers give their sons handguns when they turn 18...pacifying…NOT! - Obviously, I lost my wallet. For almost 18 hours. A friend of the hostel found it. A round of Raki for everyone! 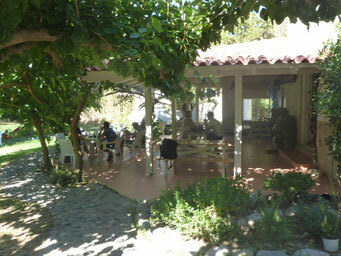 - A Hostel trip to a small village, to a much smaller tavern. Absolutely fantastic. Delicious, local, authentic, cheap. And on the way back I was sitting in the back of a pickup truck. Amazing to see the mountain passes and canjons from up there. - Chilling romance. A lonely trip to the sea for a swim in full moonlight. - Great hostel BBQ party. Now guess who was one of the two grill masters. - Ceviche: raw fish salad. A gorgeous dish from Rachel. Yummy!